Why is golf so good for business? Golf is big, regardless of the entry requirements and stigma that may be associated with golf clubs in some quarters. There are over 60 million golfers in the world with 1.5 million golfers who play each week in the UK and over 3.9 million playing annually at their local golf club. When you look at how many top CEO’s, movie stars, sports stars and entrepreneurs who also play golf you’ll find those numbers equally impressive. An estimated 90% of fortune 500 CEO’s play golf and executives who play golf make on average of 17% more than those who don’t. So, golf and business clearly go together and playing certainly has an attraction to those in business but why? Well, there are as many reasons as there are benefits. Golf is a great networking opportunity due to the fact that golf provides a lot of time for communication. Where else can you spend four quality hours with the company CEO, client or prospect? In today’s busy times you would ordinarily be lucky to get 10 minutes. In a casual game, You have lots of time to connect with someone you intend to strike up a business deal with. There is simply no other sport with the amount of quiet time between shots that allows for wide-ranging conversations and mutual interests to be discovered. It allows for time to get an impression of someone and to hopefully give a good impression. By the time a round is through, there could be enough reason to be able to make a decision on how a deal should move forward. Golf also offers the opportunity to do business meetings in an office surrounded by trees, water and well, nature – hopefully with a blue sky too, instead of four white walls. This alone creates a more relaxed and friendly environment to converse, be creative and do business. Golf courses offer an opportunity to connect with nature in a unique way. All without the normal distractions. Couple this with a sporting activity that doesn’t have high demands physically yet still provides physical activity. A sport that is playable within a much wider age and health range and you’ve got a winning combination of relaxing surroundings, physical activity, fresh air and no barrier to age or experience. Much about golf is perfecting the technique of the perfect and consistent golf swing, which one does not need to be exceptionally young or physically fit for. You can learn a lot about the people you work with or about to go into business within four to five hours of golf at the local golf club. Not just from what they say but how they handle themselves on the course. Do they take lots of risky-shots? Then, they may be a risk-taker in business too. Are they the type of person who will cheat or cut corners, help others, see the lighter side or overly stress. Do they play by the rules and control their emotions? Or do they blow a fuse? Conversely, it’s also an opportunity to show your great attributes on the course and in business. Golf can provide you with the opportunity to build friendships that can last a lifetime. Whether this is with a college, senior executive or client. An interest in golf alone can be enough to move friendships closer and help you up the corporate ladder too. Playing golf with clients and colleagues gives you additional insights into their personalities. 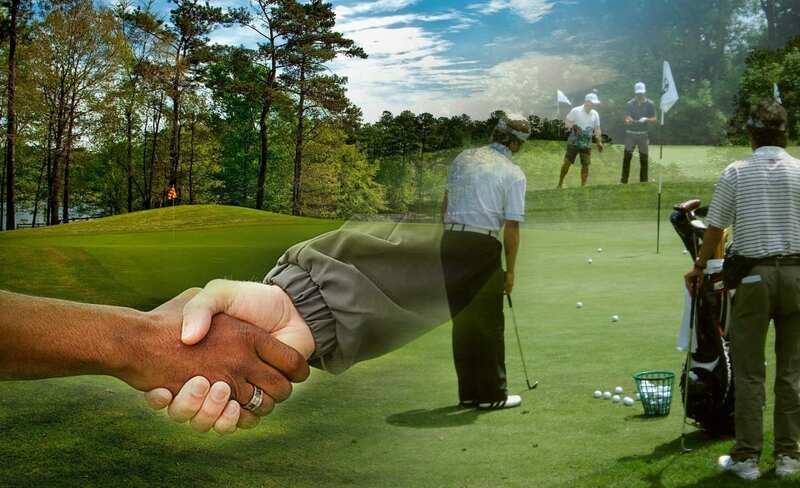 Golf provides a great opportunity to sell your products and services as you bond and forge relations. When travelling, golf can also be a great way to open doors. If you can let prospects and clients know you are in the area and up for a game of golf you’d be surprised at the doors this can open. This is where multi-club membership can be especially useful too. Then you’ve got a captive audience and if you are able to parlay a round of golf into an opportunity for lunch or a drink at the bar afterwards, you just may be able to close a deal in one afternoon. Simply, golf provides a great opportunity to show up at the club and get a game on. Now, depending on the type of business you’re in this could mean that every time you tee up you could be looking at two or three prospects. So, don’t wait any longer, get out of the office and head to the course, to boost your business today!